Solais Luxiance® Therottle™ Xi20 Collection J-Track fixture employs 15-Watt global socket PAR20 LED lamp with average lifespan of 50000 hours delivers brightness of 1050 Lumens. This 25-degree LED lamp has color rendering index of 83 and color temperature of 3000K. Lamp has voltage rating of 120-Volts and power factor of 0.92. 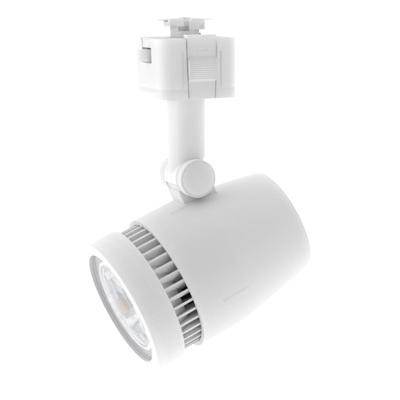 This 5.4-Inch extension track fixture in white finish, features tempered glass lens construction. Head of this dimmable track fixture measures 2.5-Inch Dia x 3.5-Inch. It is suitable for use in track and supports surface, pendant and troffer mounting. Track fixture is UL/cETLus listed, RoHS and FCC compliant. * Inventory displayed is accurate as of 04/19/2019 03:40 EDT.